The Cleanest Line® is a design ethic and guiding principle that we strive for in order to create the most streamlined, efficient and comfortable fishing gear available. While others have been caught up in a frenzy of adding more zippers, pockets and doo-dads, we strive for less. Less weight. Less hassle. Less line-snagging add-ons. With everything we make, our goal is to carve away the unnecessary, sharpen the utility of what’s needed and strive to build/deliver our products in harmless fashion. It’s another way of saying what we’ve believed all along – great gear disappears. 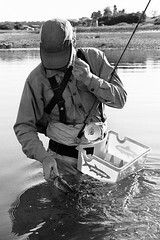 Visit Patagonia Fishing and click around to see what's new for 2009. In addition to gear, note the new fishing ambassador pages and a host of content that we plan to refresh with some regularity (conservation, videos, field reports, and more). Have a look Way Upstream community and tell me what you think. Keep up the good work over there. I posted a link to my ambassador page on facebook and got 4 comments in less minutes. Good ethics and great products is a good way to do business. Thanks for the compliment and blog link Urbanflyfisher. Try to attend the Film Tour in Ventura next month. We're working hard on this end Mikey. It's great to have you officially on board. Nice piece on Caples Lake by the way. Patagonia Fly Fishing: "Everything that you need, and nothing that you don't." The new Fly Fishing landing page at www.patagonia.com is packed with new product, ambassodor profiles, and other goodies. It's a great start to the 'O9 season! It's great to have you officially on board too Topher. I think 2009 will be a fun year with lots of ambassador collaboration.